This site has turned out to be the most important of them all. Over 8000 years old, this site could have easily been missed – suggesting that there could be many more yet to discover. Members of La Société Guernesiaise noted a granite slab after a gorse fire. The newly cleared area was quite a high mound obviously burying something of antiquity. 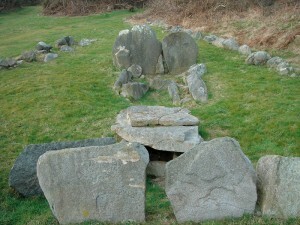 (Unlike the mounds between the eight and ninth fairways – these are from an old shooting range). If this slab protruding from the mound represented a new megalithic site then this would be the first new discovery since that at L’Islet in 1911. (Ironically in a field called at the time ‘Les Fouaillages’). A trench dug in 1978 confirmed that the structure was man made and some flint and pottery was found. Work to uncover the story of this mound commenced in 1979 and though the archaeologists where expecting maybe ‘just’ another version of the tombs found around this area along with a few flints, they uncovered a spectacular record of human activity over a period that started 8000 years ago with a primeval forest and very early hunters. The site today shows the monument in its second phase 6500-6000 years ago when it might have been used as a monumental tomb. No bones could have survived the acidic soil but pottery suggests funerary offerings in the larger chamber. Ian Kinnes and J. A. Grant, in their book about the dig go on to explain that the site was used in four more phases: around 6000 years ago the tomb was closed; phase three c5000-4000 years ago saw another structure being built, a shrine or mortuary house. An oval space 3.8m across was enclosed by concentric setting of huge boulders along with two similar contructions but this time semi circles. At the centre were two large wooden uprights set 2.4m apart. Stick a roof on that and we are talking about a fairly large building considering the archaeologists do not think that it was for domestic use. This structure then went out of use around 4000 years ago when it was formally sealed with a stunning offering of eight flint arrowheads. Four were made from honey-coloured flint imported from France. Some 200 years later, from around 1800 BC onwards, no traces of activity have been found. A tiny fraction of the 60,000+ finds are on display at the Guernsey Museum but the best display is the actual site. It is getting a bit overgrown since the digs but is still worth a visit. 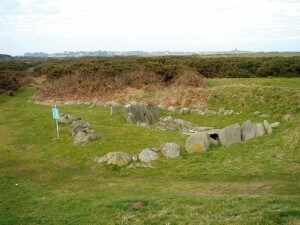 In their book about the dig Les Fouaillages and the Megalithic Monuments of Guernsey the authors talk about each phase in detail and I would recommend it for further reading on this site – if you can find a copy!